One of the keys to ensuring healthy nutrition is a varied and balanced diet. However, in rural areas of El Salvador where poverty, inequality, low wages and lack of employment mark the day-to-day reality, the scarce variety of nutritious products is hindering fundamental rights such as food security. This challenge, which begins with pregnancy and is reflected by the concerning rates of child malnutrition, must be addressed from a different perspective. Ana Reina Salvador lives in the neighborhood of El Caulote, in the Salvadoran municipality of Las Vueltas, in the Chamatenanco department. In her backyard, Ana Reina has created a family garden, where she grows cilantro, celery, radish and pineapple, chives, onion and onion garlic, jalapeno peppers, tomatoes, parsley, radish, cucumber, guavas, blackberry, granadilla and peppermint, as well as ornamental plants. She also has a small but growing chicken farm. “All of the produce are organic. This garden benefits my family as well as our neighbors. All the produce here are fresh, healthy and natural”, Ana Reina explains. Ana Reina Salvador is one of the hundreds of women head of households who benefit from the joint programme “Nutritional and Food Security for Children in Salvadoran Homes” (SANNHOS) promoted by the United Nations Sustainable Development Goals Fund (SDG Fund) in El Salvador in order to help improve food security and nutrition. The objectives of the SANNHOS programme are: 1) betterment of local production, both at the early stages and the final stages of production; 2) expanding of the local nutritional information systems; 3) increasing the resilience of communities and that of the production of foods against climate change; and 4) the strengthening of the public politics and joint initiatives. The SANNHOS programme specialist have aided Ana Reina through a number of different workshops regarding organic production, food management and the preparation of healthy recipes in addition to how to plant and take care of her produce. She has also received enough resources to build a small chicken farm, which began with 10 chickens but, has since the time of this interview grown to house more than 60 egg laying hens. The idea behind the family and home gardens of the SANNHOS programme, is that the production of diverse and nutritional foods throughout households, is the first step towards effectively working on ensuring the right to access to adequate food. Families are able to meet their nutritional necessities with what they produce in their gardens and in small livestock farms which ends up directly benefiting their health and teaching families a number of different techniques they can use to achieve food security while also working in harmony with the environment. Moreover, family gardens can also result in the creation of extra supplies of fresh and quality produce which can be sold within the community, resulting in a positive impact and one which reaches out and helps other families outside of the SANNHOS programme. Family gardens also help in preventing becoming vulnerable to price increases and dependent on food and products coming from other municipalities. 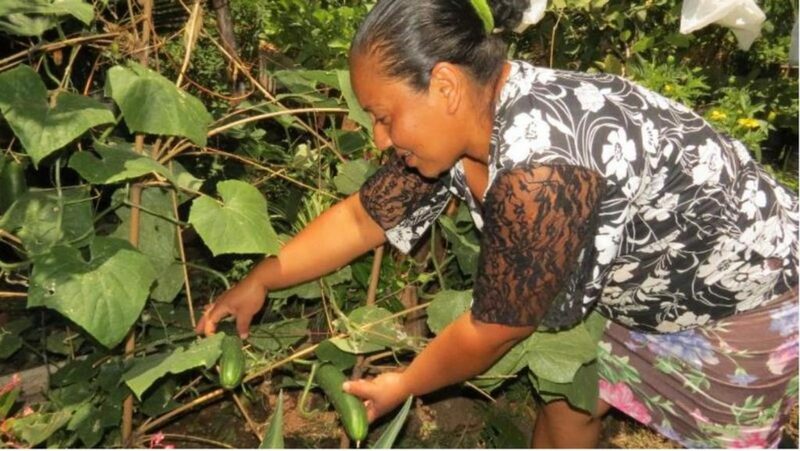 As a beneficiary, Ana Reina Salvador participation in the SANNHOS programme has helped her to become a more productive women and leader within her own community, as well as a “model family” that will continue to support and help other families in the creation of their own family gardens. “The idea is that we do not let the project die. That we continue to plant and grow in order to insure that we have a fixed food source”, Ana Reina said. The SANNHOS programme creates an integrated approach directed towards families, in which the role of women is strengthen by allowing them access to health awareness, food, nutrition, technologies, training and technical assistance in the implementation of projects and micro-entrepreneurship, while also taking into account gender perspectives and human rights, including the right to access adequate food.